Along with a few other like minded ex and retired miners, we have set up this association because we wanted to remain informed, and be a part of the National Union of Mineworkers. This new association gives us real representation inside the union, and will have many benefits. Whether we are successful in our aims, will depend on our membership levels. Please spread the word as a matter of urgency, we need your support on a variety of important issues that still affect us. Our membership is growing at a steady rate are represented through the union, and can get advise on the plethora of issues that still affect miners, i.e. pensions, health care, etc as well as organising the odd trip or social event to see old workmates. 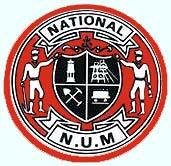 Nottinghamshire NUM Ex & Retired Miners Association .